Apple’s App Store generated nearly 94 percent more revenue than Google Play during the third quarter, according to the Store Intelligence data released by Sensor Tower. This is considered to be the largest gap since at least 2014. Nearly 66 percent of the total mobile app revenue reported in the third quarter was generated by the App Store, growing 23.2 percent year-on-year to total $12 billion (roughly Rs. 88,320 crores). Google Play spending, on the other hand, increased 21.5 percent year-on-year to $6.2 billion (roughly Rs. 45,630 crores). Back in July, Sensor Tower revealed that the $38.5 billion (roughly Rs. 2,63,000 crores) revenue generated by the App Store in the first half of this year was close to twice the $20.1 billion (roughly Rs. 1,48,000 crores) revenue generated by Google Play. The fresh numbers published by Sensor Tower show that the total spending on Apple App Store and Google Play reached $18.2 billion (roughly Rs. 1,34,000 crores) in the third quarter, a 22.7 percent increase over the $14.8 billion (roughly Rs. 1,09,000 crores) was spent during the year-ago quarter. 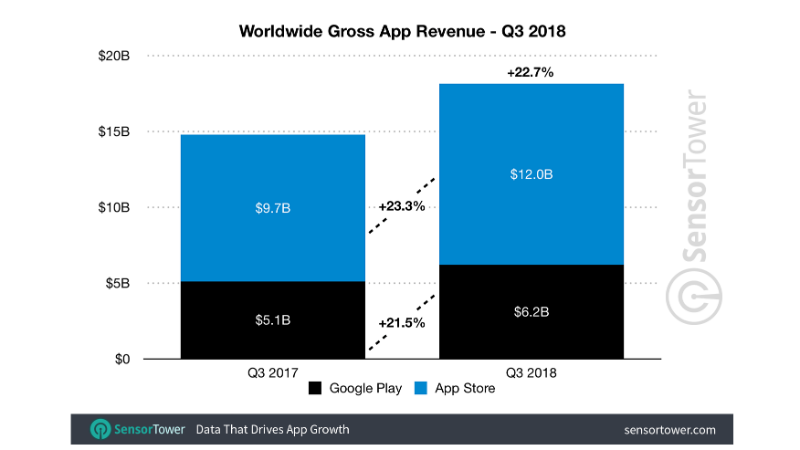 Despite the wider gap on the part of app revenues, Google Play continues to be the leader in terms of app installs with the third quarter growth reported at 14.3 percent, growing from 17.1 billion to 19.5 billion year-on-year. 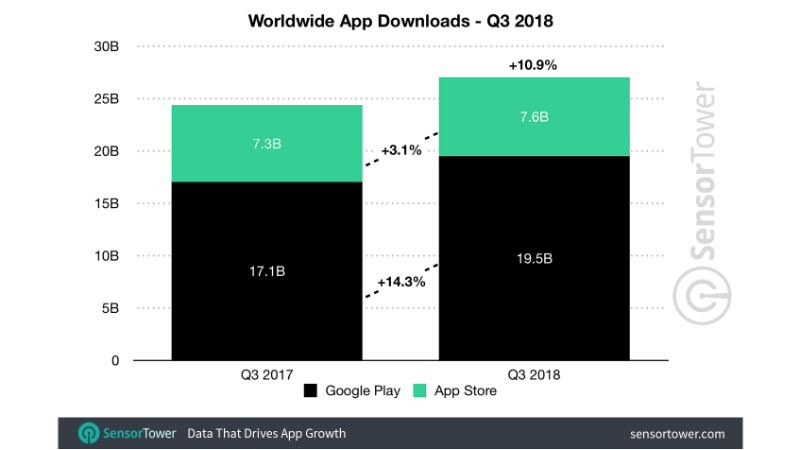 App installs on iOS, on the other hand, new app installs reached 7.6 billion for the same quarter, a 3.1 percent increase year-on-year from the 7.3 billion first-time downloads reported in the in the third quarter last year. The overall app installs grew 10.9 percent across both the App Store and Google Play combined to 27.1 billion. This shows an year-on-year growth of 24.4 percent. In terms of top grossing apps, Sensor Tower’s report shows that Netflix emerged as the “world’s top-grossing, non-game mobile app” for the third consecutive quarter in the third quarter, with it adding $243.7 million (roughly Rs. 1,794 crores) of revenue to both platforms from in-app subscriptions. This is followed by Tinder and Tencent Video that both retained their second and third rankings on the Sensor Tower results, respectively, from the second quarter. On the downloads front, Facebook topped the global app download chart with four of the top five apps for the third quarter. Interestingly, short-video app TikTok that absorbed social karaoke app Musical.lyduring the quarter, emerged as the fourth highest downloaded app worldwide with a massive year-on-year growth of 440 percent. Alongside the increase in revenues and downloads from apps, mobile games were also able to attract new users in the third quarter. Sensor Tower reveals that mobile games spending increased 14.9 percent year-on-year during the third quarter to $13.8 billion or 76 percent of all app revenue worldwide across Android and iOS platforms. Between the leading stores, the App Store accounted for about 62 percent of the total mobile games revenue with $8.5 billion (roughly Rs. 6,25,000 crores). This grew 12.8 percent from the year-ago quarter. In contrast, the gaming revenue from Google Play grew 18.4 percent year-on-year at $5.3 billion (roughly Rs. 39,000 crores). This notably represented 38 percent of all money spent in mobile games on both the App Store and Google Play during the third quarter. Revenues in the market of mobile games were led by Tencent’s MOBA Honor of Kings, while Niantic’s Pokemon Go emerged as the top-ranked Western made game by revenue. Also, Epic Games’ Fortnitereached the ninth position despite not being available on Google Play. On the part of downloads of mobile games, they grew 2.2 percent worldwide year-on-year last quarter to total 9.5 billion downloads on both Android and iOS. Google Play unsurprisingly saw the majority of downloads, specifically, 7.2 billion. This represented about 76 percent of all mobile game installs and grew 2.4 percent from the seven billion downloads reported for the year-ago quarter. On the App Store, game downloads grew 1.6 percent to 2.3 billion, up from 2.2 billion in the third quarter of last year. PUBG Mobile, which is among the top-trending games by China’s Tencent, reached the top five list of most downloaded games, though game downloads continued to be driven by hyper-casual games, led by Helix Jump from France’s Voodoo.